Home Sweet New Home || Moving Day! I promised you a crazy new home story and that’s what I plan to deliver in honor of our moving day! Similar to our previous house shopping experience, stumbling upon the perfect home for our family wasn’t done in a conventional way. When we moved to our neighborhood five years ago we had no clue we hit the jackpot. 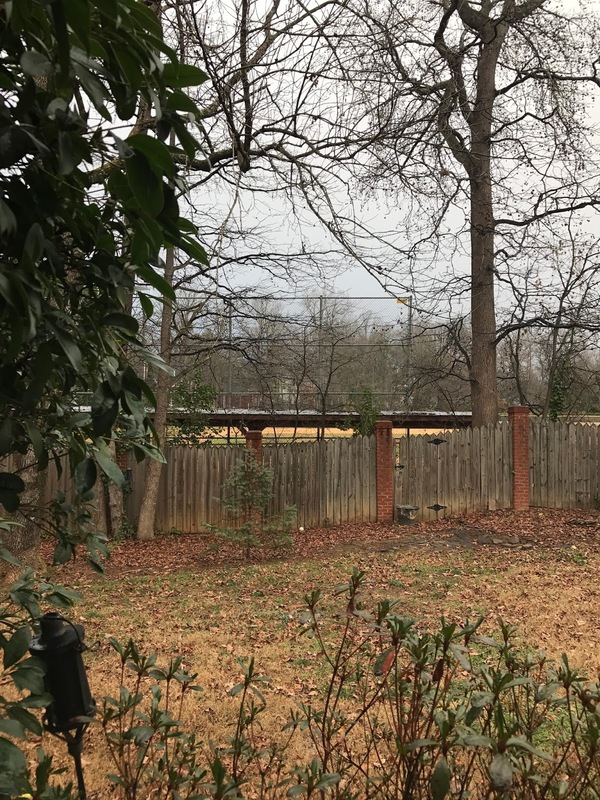 We selected our home because of the house, the school district, the convenience to everything and the charm of an older neighborhood lined with old oak trees. However, we quickly realized our home came with so much more. We have the friendliest neighbors, the streets are always busy with kids riding bicycles, fun block parties, wine nights and more. But what I also didn’t expect was to live streets away from some very best friends I would make over the years. So you can imagine our concern when we started to max out of space in our current home but couldn’t imagine leaving our beloved neighborhood. So we decided to stay put and live on top of each other for awhile, maybe even a long while, to save up for adding a second story to our house or purchasing a new home. Then one beautiful November day, while walking down our favorite street in the neighborhood we spotted a “For Sale” sign. This particular street has infrequent turnover so when a home pops up it always piques our interest. So we decided to tour it. It was out of our price range and also required a pretty substantial renovation so we quickly passed. However, while standing in the front yard admiring the home a friendly neighbor blowing her leaves across the street stopped over. She asked if we were buying the house and we told her that we were not but that our goal was to stay in our current house or buy a home on this street one day. She smiled so big and said “well, that house is just OK, but your cute little family would love this house” and pointed to the beautiful home next door to hers. We smiled and agreed the home was gorgeous but it was missing something important — a for sale sign! The neighbor then went on to tell us how the homeowners moved abroad more than a decade ago and had been renting out the house ever since. However, the most recent tenants had just moved out and the house was now vacant. So across the street we marched to peer into the windows while our realtor made a few calls to get us inside under the guise of “potential renters.” Within a few minutes we were standing inside the house. We hadn’t even made it through the entire home before we knew it was our perfect forever home. The home checked every box. 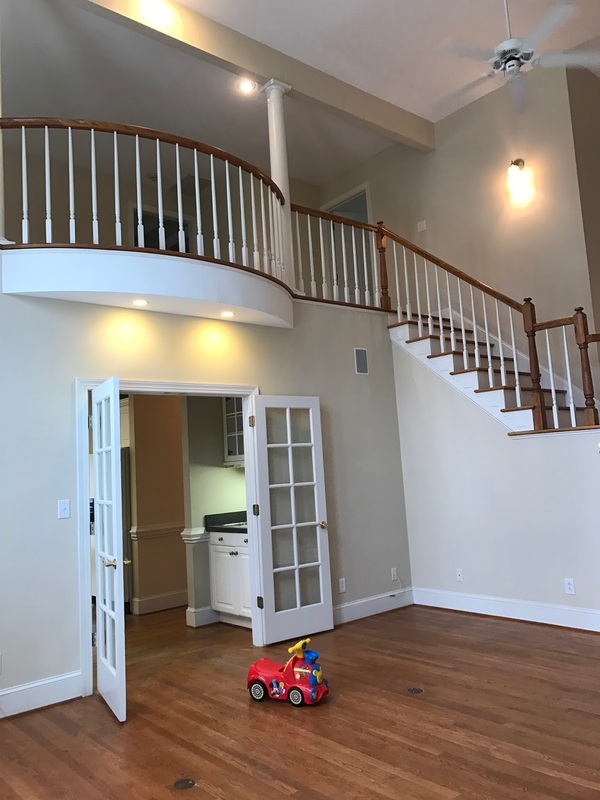 Although it is only 500 square feet bigger than our current house, the floor plan is laid out so perfectly and includes additional amenities such as a play room (!!!! ), an extra bedroom, a half bath, a two car garage and our personal favorite feature — a backyard that wraps around a baseball field. In fact, from the kitchen window you can see right into the dugout. We fell deeply in love and knew this house was the one! Later that night Matt and I came up with a game plan to track down the owner and ask him if he’d be interested in selling his home. The property management company wouldn’t disclose the owner’s information to us and also refused to notify the owner that he had an interested buyer (not renter). So it was up to us to do did a little detective work on our own. 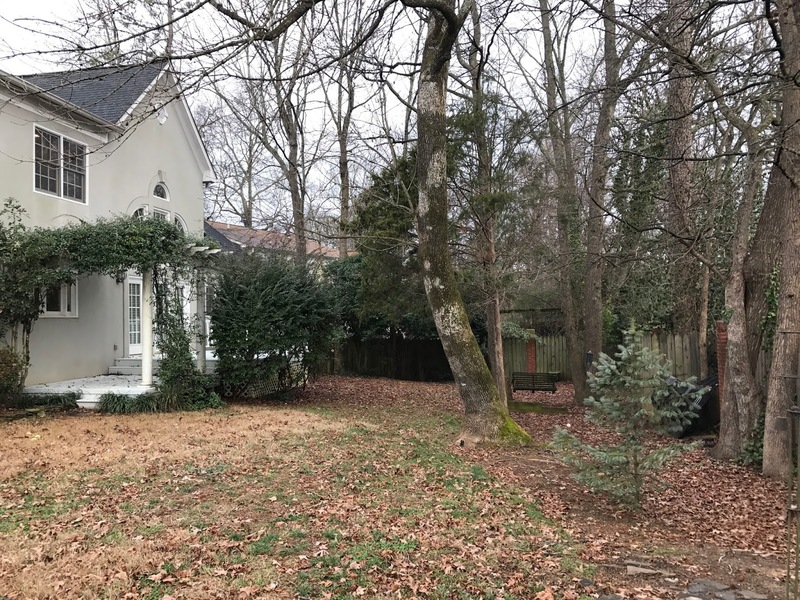 This was a challenging negotiation since the owner was 10 years past being familiar with the Charlotte market, the current value of the home and also the condition of the home. For weeks we went back and forth refining the terms of the sale, which including purchasing the home as-is, which obviously was a huge risk for us, but one we were willing to take. Quickly we needed to sell our current home so we threw it on the market a week later. I can honestly say I hope to never have to sell a house again. Keeping our home tidy with two wild toddlers was no easy feat. On top of that, Charlie is too old to attend doggy daycare so I would have to drop whatever I was doing at the office to run home, pick him up and drive him around the neighborhood (for sometimes more than an hour). We had a lot of interest in our home the first two weeks but no offers so out of desperation we dropped the price and received two offers in one day! After some back and forth we officially went under contract and closed on both homes 90 days later. As I mentioned, the home had been a rental for more than a decade and during inspections it was clear the property had not been cared for. In fact, the master bathroom floor was sinking in due to a shower leak that had not been repaired for years (much more on that below). It was an unexpected and expensive project to tackle but we are currently doing a renovation of the master bath, which will not be complete before we move in. There were lots of other issues but we forged on and knew it would be worth it for our dream home. And now, the only reason you probably clicked on this post, a few unedited iPhone pictures. Welcome to our new house! Many windows were rotted out and as a result were allowing moisture in so we are replacing the worst offenders (marked with blue x’s). And matching decoupage entry nook! I can only imagine the floral arrangements that been displayed in that space! 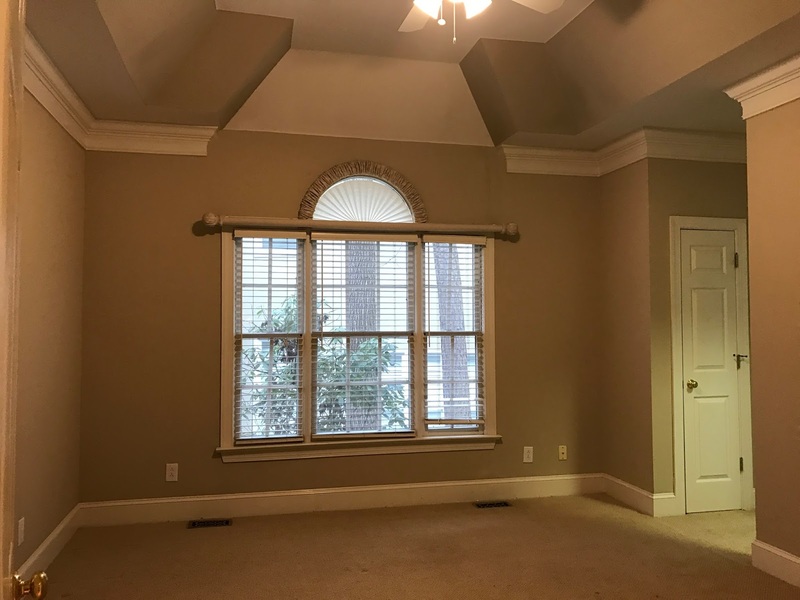 I am so obsessed with the dental molding and ginormous window in the dining room. Too bad our kids won’t be allowed in here until they are 20. THE PLAY ROOM (which yes, it definitely deserves all caps)! Cannot wait to house ALL THE TOYS in their very own room that is NOT our family room! Living Room: I swoon over the lighting in this space and of course that fireplace!! We are currently refinishing the hardwoods throughout the house. They were in pretty nasty shape and I’m excited to go a little darker. Also, I mentioned on Instagram, when Matt and I walked into this room we both immediately agreed on Christmas tree placement. It’s funny the things you look for in a new home! See what I mean about those windows?! SO IN LOVE. Kitchen: Off the living room is our kitchen which includes a wet bar (Matt’s favorite feature) and a breakfast nook. 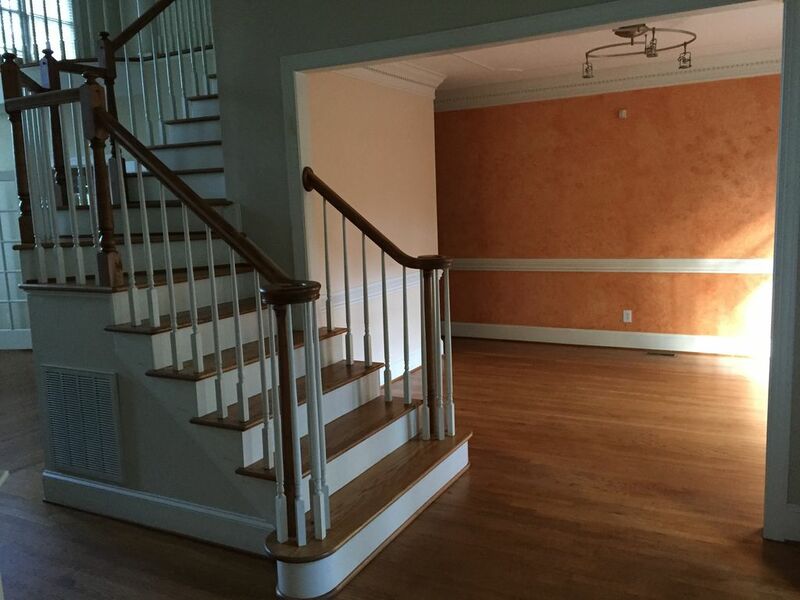 Entertaining is huge for us and the layout of this home is so phenomenal for that. Keeping her — she’s vintage! In other exciting news, I get to unstack our new washer & dryer set! #shortpeopleproblems Oh, and it was a hard decision, but we ultimately decided to part with the wine wallpaper border, although it looks like tractor wallpaper in photos (which would be even cooler). Y’all, there is SO much wallpaper in this house — SO MUCH. 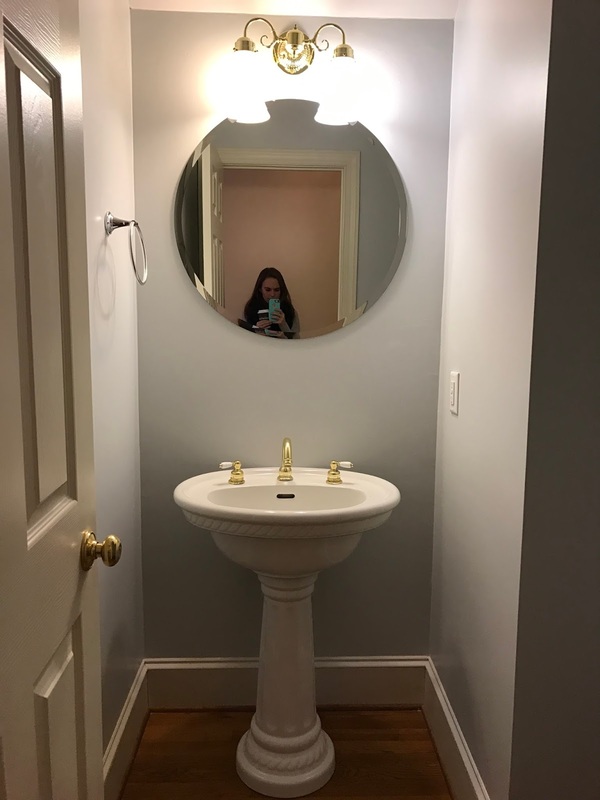 Powder Room: Pretty cool plans in store for this little powder room downstairs. Master bedroom: I’ve spent many light nights searching Pinterest on how to hang curtains with a half moon window. Gotta love the 90s built home features! 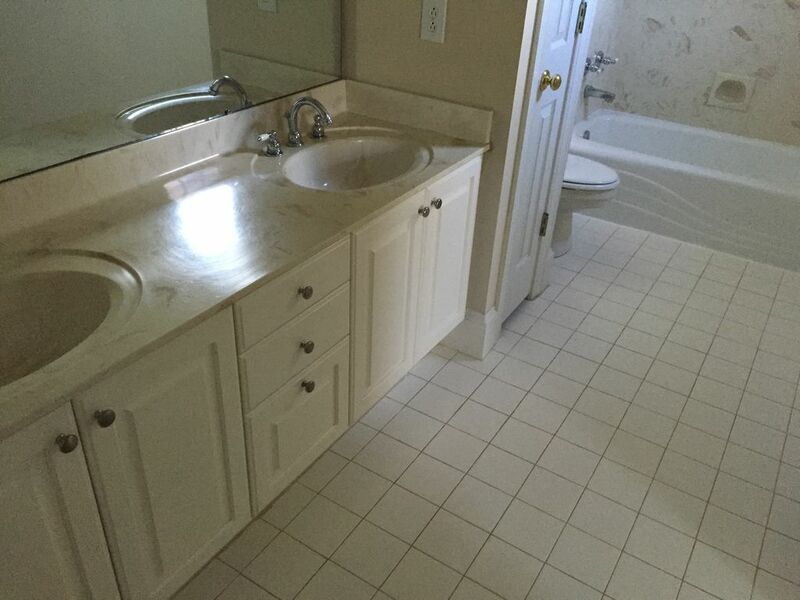 Master Bathroom: Okay, let me give you the 20 second run down on the lovely master bath. During inspection we asked why all the tiles were cracked on the floor. Turns out there was a leak in the shower that cracked the shower pan and rotted out the floor — likely over the course of a DECADE. So the floor is literally sagging and resting on our plumbing under the house. The leak also molded out the walls to our closet which shares the other side of the shower wall and created a nasty mold problem that required professional remediation. So this bathroom is pretty much where ALL of our money has gone (I’m looking at you $6K floor joist!). We had to tear out the floors and lay new wood, rip out the shower to repair the leak and replace the shower pan. But the good news is I get an updated master bathroom (which would have never happened if it weren’t for the urgent leak issue). So the current state of this bathroom is in the demo stage. We had to stall the work to give the hardwoods company 10 days to lay the flooring throughout the house and they will resume work after we move in. 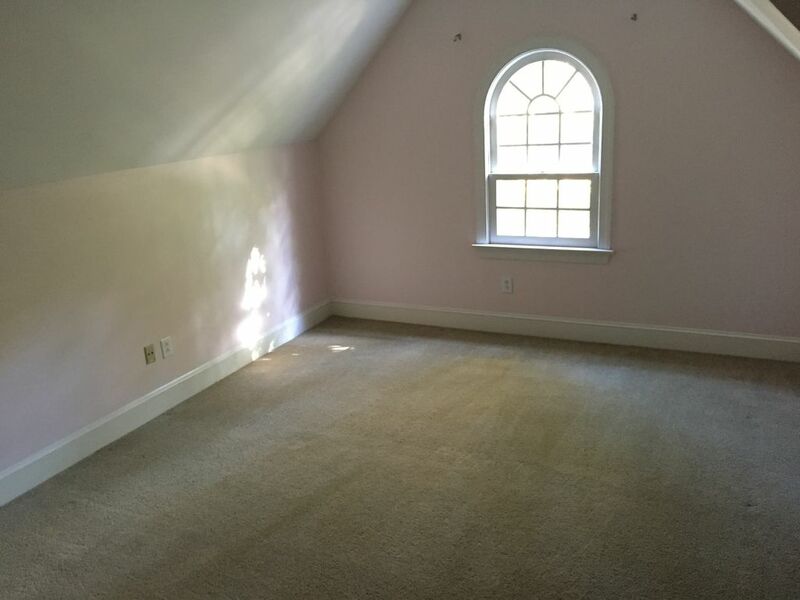 Caroline’s Room: I am so dang excited to transform this space into a big girl room soon. We selected this room because it shares a door with the bathroom. 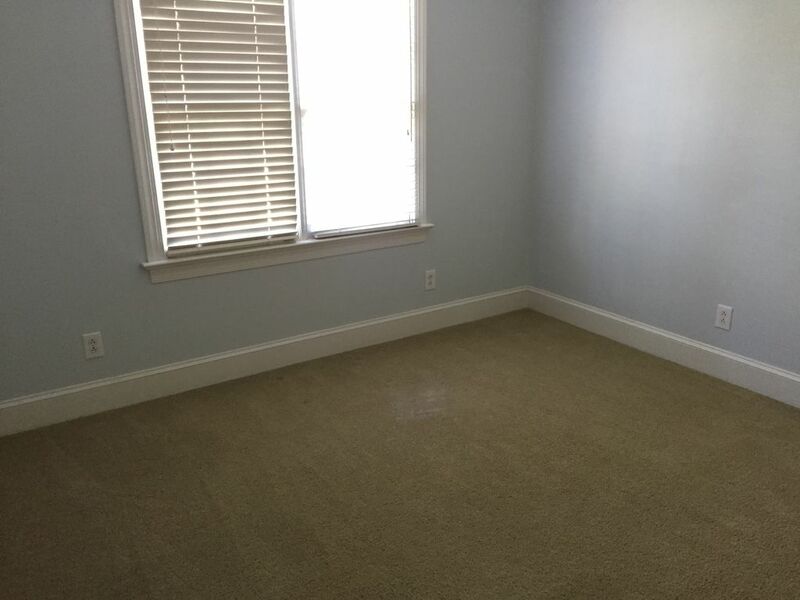 Thomas’s Room: He beat Caroline out for the biggest of the 3 bedrooms. All of the bedrooms were small which was actually something we shopped for. Now that we have a play space we don’t want the kids rooms to be a place where they play or spend time in outside of sleeping. 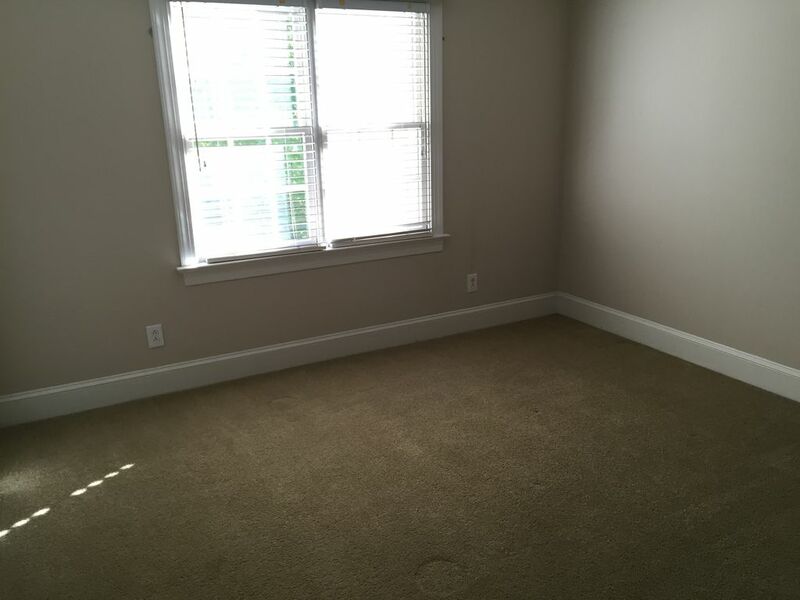 Guest Room/Office: This will likely just be the empty room where we set up the bounce house on rainy or cold days. Kids Bathroom: Eventually we’ll do some work in here. And by eventually I mean probably in 10 years. So there she is! We’ve done a few projects since all of these pictures were taken and I can’t wait to share the updates soon! Lastly, thank you all so much for your excitement! We cannot believe this happened to us (after 6 very long months) and are so grateful for this new home! We are moving in TODAY! Look at that 90's gem! I cannot wait to see her transformed into a nice 2017 home. Congratulations on such a sweet find! 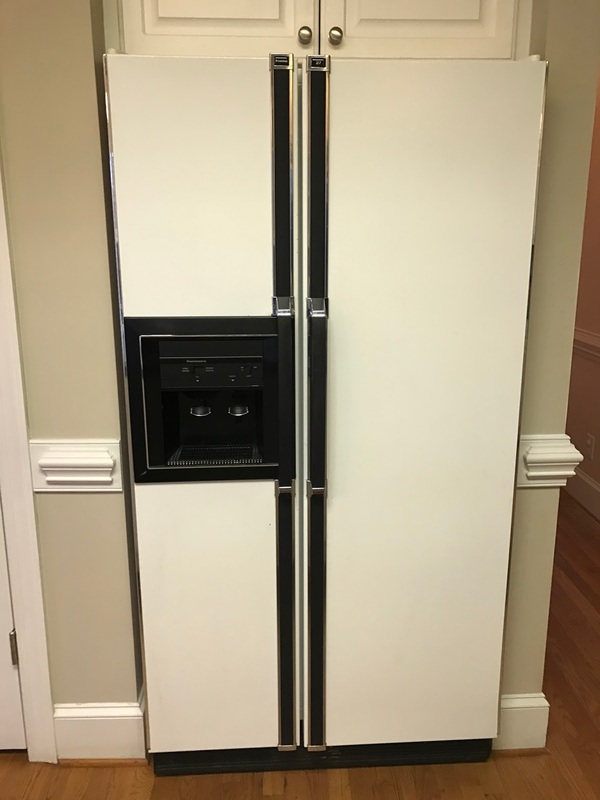 Just think if the kids do baseball/softball you won't have to travel far 🙂 That fridge though….hello my childhood! So exciting!! Gorgeous home that I know you guys will make so many priceless memories in for years and years! In love with this home!!! So exciting for y'all!!! I am going to love all the posts about the renos too!!! Congratulations guys!!! So excited for you! Cheers to moving day!! Wowzers, that is so exciting! Good luck settling in! Oh wow! What a space, I love it! So many projects, but that can be so dang fun. So happy that it worked out for you guys! What a beautiful home — that great room, WOW! Gorgeous. 🙂 I so appreciate your realistic attitude toward everything, too. Sometimes I feel like people move into their homes and gut the whole thing immediately and build their dream home in the blink of an eye, when I know in reality it's an ongoing effort for most of us! We just moved into our new home in October and it's been so fun to dream, plan, and start to decorate. CONGRATULATIONS! I am so excited for yall — what a blessing!! Can't wait to see yall make it your own!! It's a beautiful house–and what a fantastic story!! Congratulations on your new home! Congratulations! I know how excited you must be! I can't wait to see what y'all have done! Congrats! You scored a gem and it's beautiful!! So exciting and wishing you many new wonderful memories in your new home. It's gorgeous!! Congrats on it all working out! SO exciting!!! Love that this worked out for your adorable family! It is beautiful! 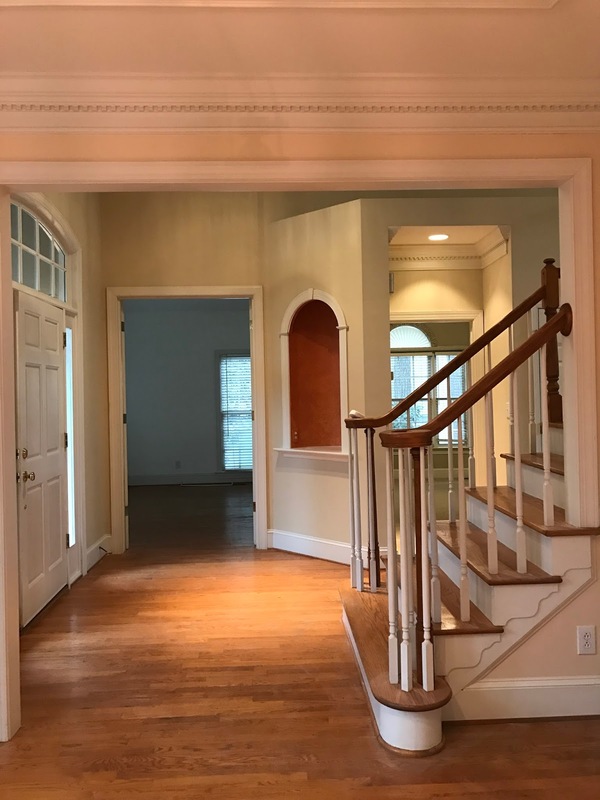 We just purchased a 90's home also and still have a lot of projects to go but its so fun to make it your own while keeping the charm of an older house. That dental molding! What a beautiful house! I can't wait to see pics as you update and make it yours! So excited and I can't wait to see what you all do!! Wow what a story! So glad it worked out for you! So smart…. Location is so key and the rest can be fixed up… Slowly! Congrats on your new house!!!! That is quite a story! Sounds like a catch of a neighborhood you discovered. Exciting that you get to stay. Beautiful! Congratulations. Those windows are amazing. So very exciting!!! Congratulations on your gorgeous new home!!! Congrats on the new home! Cannot wait to see all your ideas come to life! This is such a fun random way to snag a home on the street of your dreams! So awesome! While the bathroom is an issue – having a brand new one is the icing on the cake! 🙂 Congrats! So beautiful! Congratulations on your gorgeous new home! !We also have a half moon window kind of like the one in your master bedroom. After many Pinterest searches I finally just hung our curtains straight across pretending that the entire window was as tall as the half moon. IKEA has some really long curtains and it ends up making our room look way bigger, which was a nice surprise! !Good luck with all your renovations. I'm so happy for you! I can totally see why you guys fell in love with this house, so many beautiful spaces! I LOVE the story of how the house found its way to you, almost like it has been waiting for your family! We just sold our house and are waiting for our forever horse farm to come along, so it's so encouraging to hear the cool ways these kinds of things can work themselves out. Very encouraging! 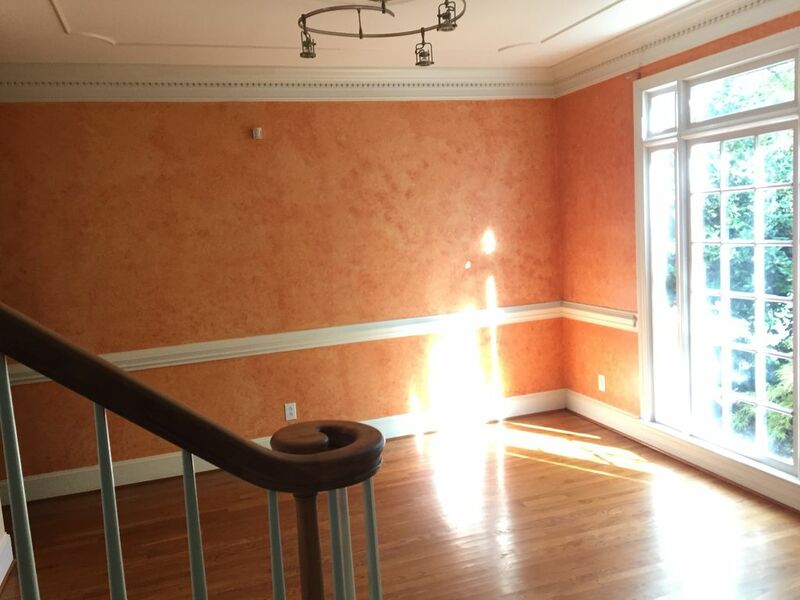 Can't wait to see how all your decorating projects unfold! Gorgeous home!! It has so much Christina potential – I can't wait to see what you do with it!! Oh the floor joists. We went through that with our renovation. So expensive. So stressful. So ridiculous. I'm so sorry that you had to go through it as well!! 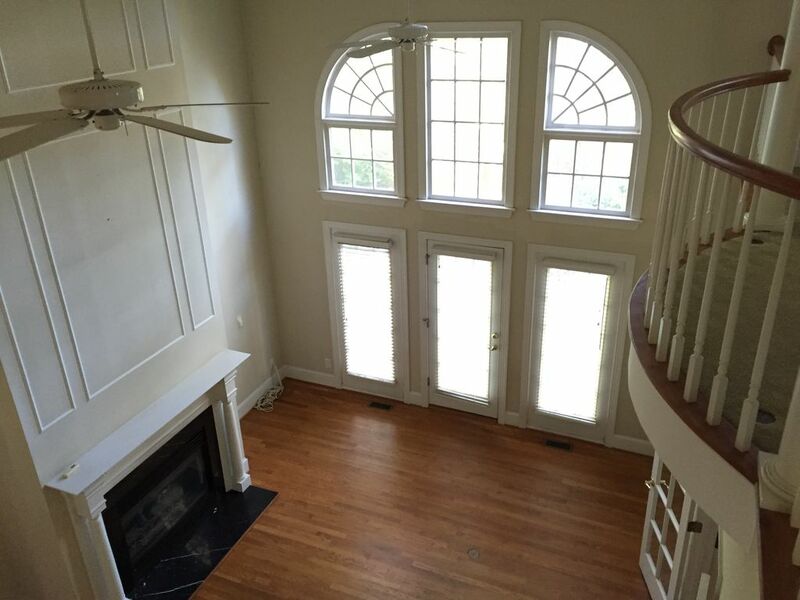 So many features of this house are gorgeous… I seriously can't wait to see your touches to it! What an amazing story – that sounds like the premise of a movie of some kind. That is awesome that you finally got it and can stay in your neighborhood. 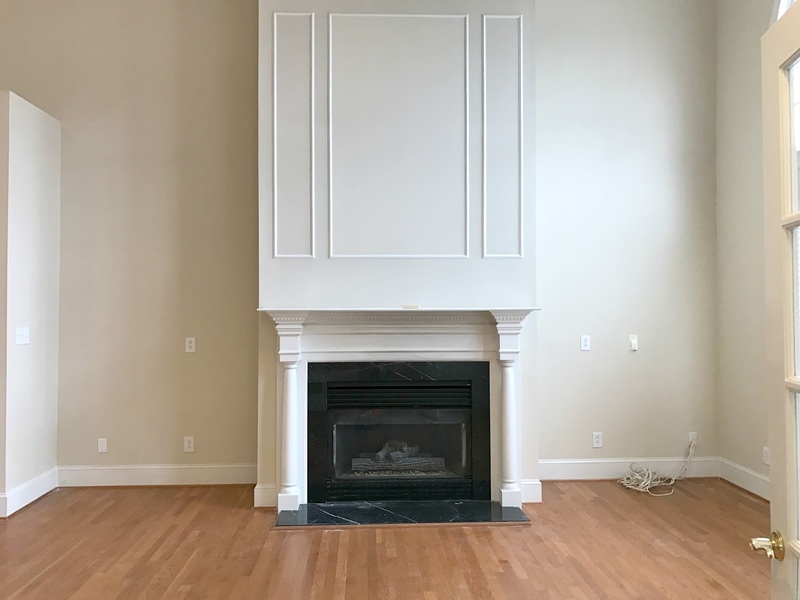 Good luck with the move, I can't wait to see how you decorate this place! Congrats!! I can't wait to see you transform the space and I'm so happy you found your dream home in your neighborhood. That's exactly what we did two years ago when we ran out of space, it was nice not to have to leave friends. Sorry about the bathroom issue but exciting you're getting an (unplanned) full renovation!